Technology: Plastic Injection Molding Services are manufacturing services used to make parts from thermoplastic and thermosetting plastic materials. The raw material is usually in pellet or granule form which is heated to form a liquid. Molten plastic is then injected under high pressure (10,000 psi) into a precision machined mold, commonly made of steel or aluminum, which is the inverse of the product's shape. After filling the molds are cooled to solidify the parts prior to ejection. Cycle times can range from 10 to 100 seconds depending on the cooling time of the thermoplastic or the curing time of the thermosetting plastic. Plastic injection molding service can manufacture parts in a variety of materials ranging from filled nylons to the various PEs, PVCs, etc. Small parts are usually made in multi-cavity mold to increase output. 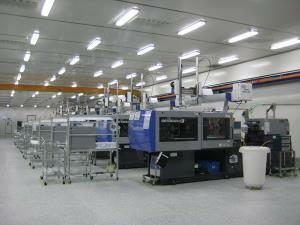 Many shops have multiple injection molding machines in a range of tonnages. Advantages: Plastic injection molding services provide low cost method of molding plastic parts in high volumes. Many services can offer expertise regarding material choice, part design, etc.